Robert Rodriguez will direct and co-write a live-action Jonny Quest movie, VARIETY REPORTED. Rodriguez has made a name for himself for his violent action pics, but his most successful films to date have been the family-friendly “Spy Kids” movies. That franchise comes from the same mold as “Jonny Quest,” making him seem like the perfect fit for the adaptation. 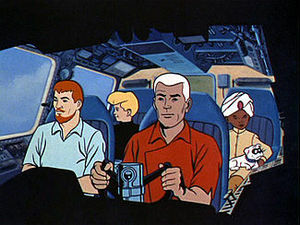 There are have been three versions of the cartoon, but the most popular among fans is the original, The Adventures of Jonny Quest. That consisted of 26 episodes that aired in prime-time on ABC during the 1964-65 season. Jonny Quest was the only son of important scientist Benton Quest. As a result, U.S. intelligent agent Race Bannon was assigned as combination tutor and bodyguard. The cartoon was created by cartoonist Doug Wildey for producers William Hanna and Joseph Barbera. It was Hanna-Barbera’s answer to James Bond and development began after Barbera saw Dr. No. Hanna-Barbera initially intended to adapt the radio program Jack Armstrong, the All-American Boy, but went with original characters instead. The Hanna-Barbera cartoon brand was later absorbed by Warner Bros.’s animation unit. UPDATE (8 p.m.): If you want to check them out, THE HOLLYWOOD REPORTER and DEADLINE: HOLLYWOOD have stories on this subject. John Stephenson, a veteran character actor and the original voice of Dr. Benton Quest, has died at 91, according to BLOGGER MARK EVANIER, who frequently writes about television and comics. Stephenson was part of a Jonny Quest cast that also included the voices of Tim Matheson, Danny Bravo and Mike Road. After the first several episodes, Don Messick took over as Dr. Quest’s voice but Stephenson continued to do a lot of voice work for Hanna-Barbera. Stephenson also served as the announcer who informed the audience of the outcome of a case in the 1960s version of Dragnet. He also was a frustrated Thrush official in New York forced to take orders from Cesar Romero’s Victor Gervais in The Never-Never Affair episode of The Man From U.N.C.L.E., one of the most popular installments of that spy series. A half-century ago, one piece of spy-related entertainment involved a villain planning to use a laser beam to shoot down a U.S. rocket being launched to go to the moon. A mix of Dr. No and Goldfinger? Sort of. It was the debut of The Adventures of Jonny Quest, later shortened to just Jonny Quest. The Hanna-Barbera cartoon debuted on Sept. 18, 1964, with The Mystery of the Lizard Men on ABC’s prime-time schedule. 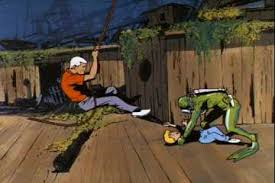 The series chronicled the adventures of Jonny, only son of key American scientist Benton Quest. The importance of Dr. Quest, a widower, was such that U.S. intelligence operative assigned agent Roger “Race” Bannon as bodyguard and tutor. According to AN ONLINE DOCUMENTARY, the project originated when producer Joseph Barbera saw Dr. No, the first James Bond film. Barbera knew it was a genre he and partner William Hanna had to develop a cartoon for. The producers initially thought they could revive the radio series Jack Armstrong, the All-American Boy. A test cartoon was made and, the Quest documentary states, part of it was incorporated into the start of Jonny Quest’s end titles. Hanna and Barbera soon dropped that idea and opted to develop their own characters. They enlisted cartoonist Doug Wildey, who ended up doing much of the heavy lifting of devising characters. Much of the finished product was Wildey’s. One major exception, according to the documentary, was Jonny’s pet dog, Bandit. Wildey wanted a more exotic pet while Bandit ended up an obvious cartoon dog. In the opener, ships are being destroyed in the Sargasso Sea by mysterious means. Thus, Benton Quest is called in to investigate with his son and Bannon in tow. Soon after, Jonny, Race and Bandit are soon in peril and stumble upon the conspiracy by an unnamed foreign power headed by an unnamed villain. The story — written by Wildey, Hanna, Barbera and Alex Lovy — reflected its Bondian influences. The plot’s McGuffin resembles Dr. No. The villain’s main gadget, a laser gun, was part of Goldfinger, which was debuting in the U.K. at the same time (and wouldn’t reach the U.S. until December). Quest was different than previous H-B productions. Characters (with the exception of Bandit) were drawn realistically, including shadowing. 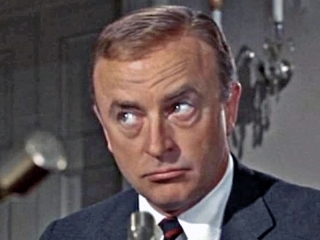 The series was helped significantly by composer Hoyt Curtin, especially the debut episode. According to the Quest documentary, Curtin wrote the signature theme in such a way that trombone players couldn’t actually play it correctly. It was Curtin’s way of getting back at the musicians who playfully complained that the composer’s music was too easy to perform. The credits on Jonny Quest downplayed the significance of Wildey and Curtin. Wildey wasn’t created as the show’s creator. On some episodes, he was listed as “supervising art director,” in others it was stated the show was “based on ideas created by” Wildey. Curtin was credited for “musical direction.” Meanwhile Hanna and Barbera got a “produced and directed by” credit in larger type for each episode. Quest wasn’t a big hit. It ran only season in prime time. It would later be rerun on Saturday mornings. In the 1980s and ’90s, there would be Quest cartoon revivals. But it was never the same. In the 2000s, there was a DVD release of that first season. But there were changes. Some politically incorrect lines were taken out. Also, the end titles from two episodes were used over and over. The writing credits for each episode were in the end titles. As a result, the viewer doesn’t really know who penned the episodes. In any case, for people of a certain age, Jonny Quest still resonates, especially Curtin’s theme. 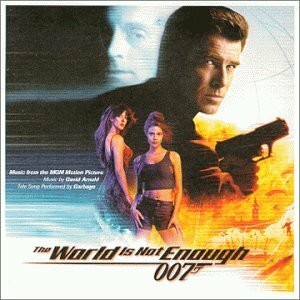 Quest’s golden anniversary, understandably, will be overlooked because of the 50th anniversary of Goldfinger. Still, for some, will look back at the series with great fondness.